All of us at ANT hope that you had ample opportunity to rejuvenate during the festive period. 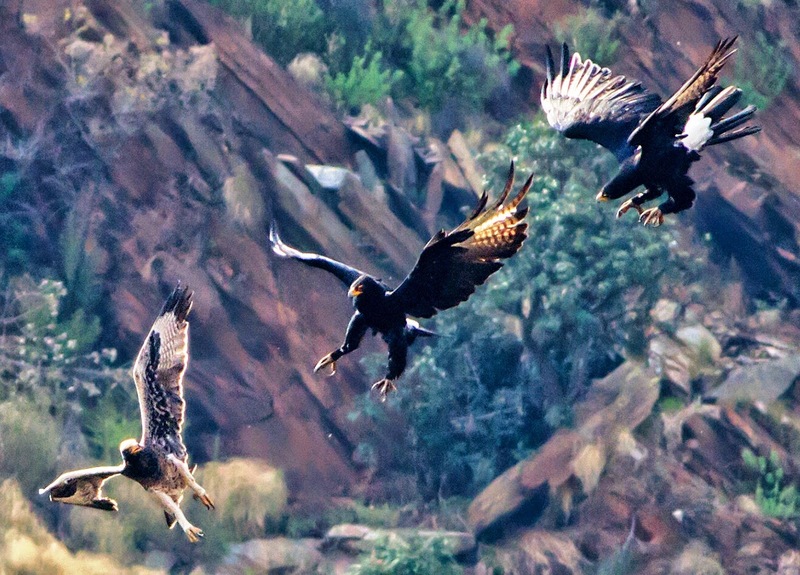 Just before we closed for the year in 2014, we received an e-mail from the Chairman of the Black Eagle Project Roodekrans (who attended our Savanna Bird Course), which we thought you might find interesting, even though it's not exactly 'hot off the press' now. It has been some time since I last updated you on what is happening. Our juvenile “Jono” is still in the natal area although the aggression towards him has started to escalate, and it won’t be too long now before he will have to leave and fend for himself. The latest newsletter below will explain this a little more. The project itself received a huge financial boost on Monday this week when Silverstar Casino handed over a cheque for R 157,433.50 to us at a special function. Their support for our work has been absolutely amazing and we are indeed privileged to have them as our main sponsor. Watch our Facebook page for a full report, and we also hope to see the Press coverage in the next few days. 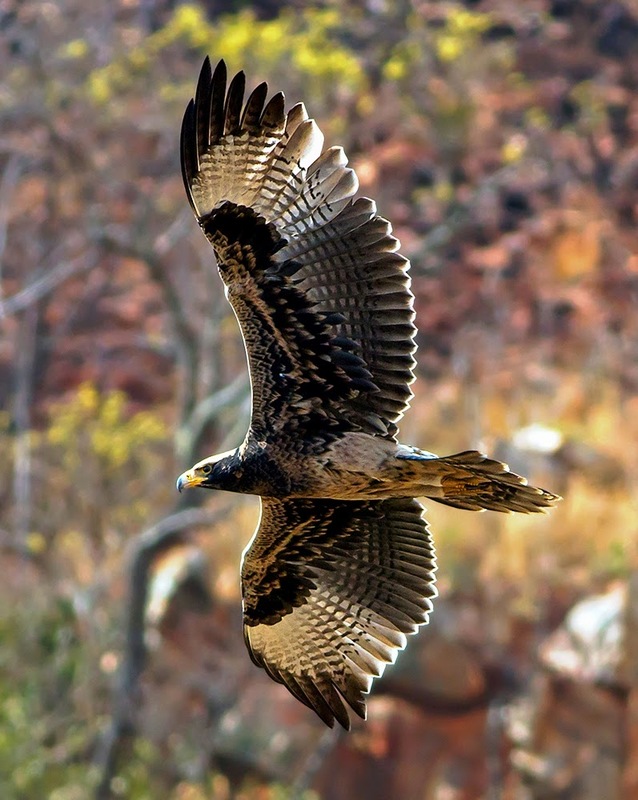 Jon Oliver, CEO of Africam.com sadly passed away just a few days before Emoyeni's chick was born in June 2014, therefore, we think it only fitting that this eaglet should be named 'Jono', which is what he was always called by his friends and family. 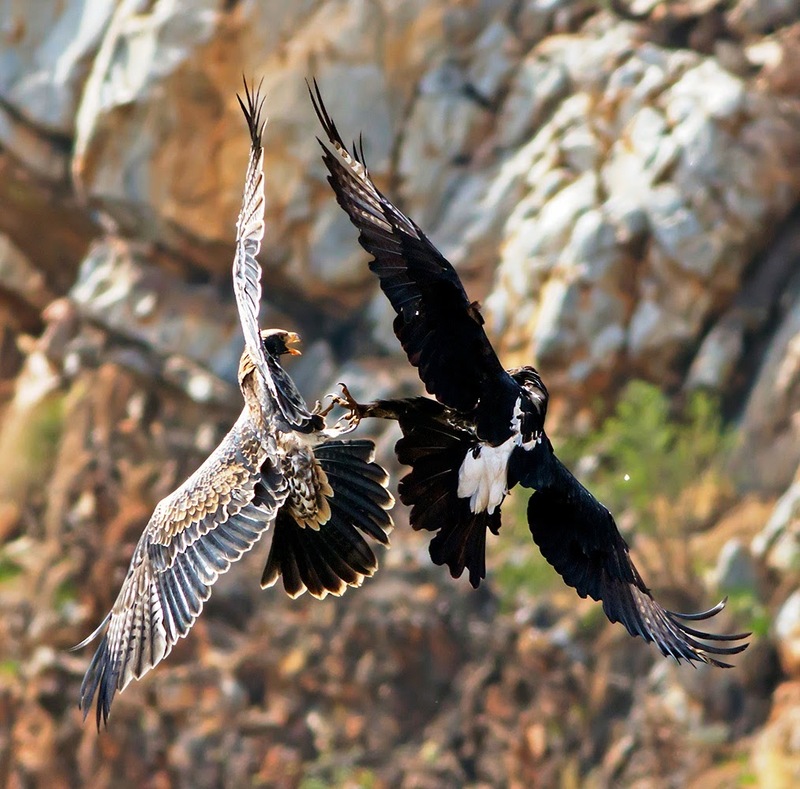 The juvenile Verreauxs' (Black) Eagle had only been off the nest for six and a half weeks when the first unsuspected parental blows of aggressive behaviour struck him during the weekend of 25/26 October! This behaviour is deemed far too soon by any standards for this species and should only have commenced during the tenth week, post fledging. 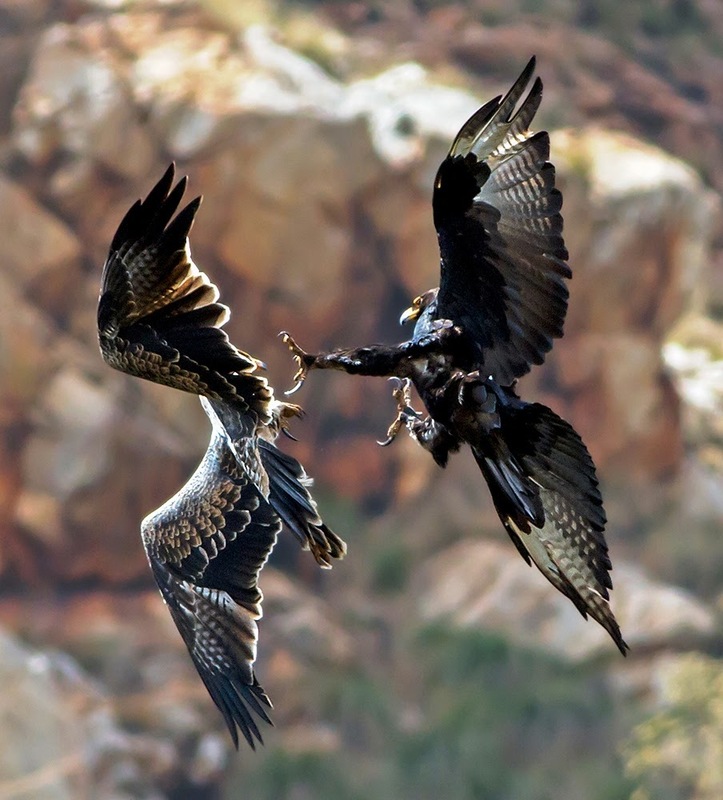 Having thus requested that the 'Black Eagle Project Roodekrans' members specifically monitor this behaviour, the juvenile had been fortunate in that there did not appear to be too much conflict during the following week and weekend, thus being quite relaxed. The calm before the storm was short-lived in that a major onslaught rained upon him from all directions on Saturday 8th November, with the female contributing for the first time too! One can only imagine how the juvenile must have felt…here he is biding his own…his parents bring him prey…he still roosts on the nest…then without any warning whatsoever the adult pair launch a very aggressive and prolonged attack upon him, and as the proverbial saying goes “you have to be cruel to be kind” rings true in this regard under these circumstances! Some of the most hardened avian photographers that have been recording the onslaught mentioned that at times it was too difficult to observe as the juvenile called incessantly in his attempt to escape the blows, be it in flight or perched…his world is coming down on him…fast and furious! Interestingly however, that Sunday, 9th November, was a quiet day with no aggression noted…as if nothing happened, which will confuse the juvenile even more in the days to come. Ultimately, in an effort to escape the relentless harassment, the juvenile will gradually be pushed out of its natal home range (territory) by the adults, which is a gradual process that can last two or three weeks and, during this period, he is unable to return to the nesting gorge that was his home since hatching five months ago. One can really feel for him, he will soon be unable to sleep on the nest that was his comfort zone and will be obliged to roost in a tree just like his parents have been doing…something he is not used to...yet. As mentioned in October, it is imperative that the juvenile achieves 100% in all his subjects as, without these qualifications, his chances of survival lessens should he be unable to grasp the importance of tuition during the post fledging stages. Sleeping on the nest during the first month after fledging is acceptable, but not during the second month and beyond...mainly because when he is shoved out of the home range area, there will be no nest anywhere that awaits him and suddenly his own instinct will have to be engaged to ensure that he must roost out of harm’s way…most preferably on a sheer inaccessible rock face or a tall secure tree. Jono was last seen at Walter Sisulu National Botanical Gardens (Johannesburg) on 12th December 2014...and we wish him a successful future - hambe kahle Jono!